No car Necessary, Winter Shuttle, On Bus Route, Close to Slopes, Heated Indoor Pool & Hot Tubs! 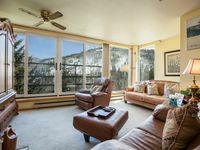 Property 2: No car Necessary, Winter Shuttle, On Bus Route, Close to Slopes, Heated Indoor Pool & Hot Tubs! Great Ski Location. I can't say more about the location. It was so close to all the Vail ski lifts. The shuttle was the absolute best...convenient and was very timely, barely had to wait at all.____Amenities were great - pool and hot tub were great. Free dvd rentals was unexpected and really nice. Loved the free wood delivery for the fireplace.____Would stay again with no hesitation.